All transactions are safe and secure with a reliable history in online purchasing behind each of our associates. Buy the We Can't Stop Here, this is Bat Country t-shirt to own Fear and Loathing clothing and merchandise. The front of this tee features Johnny Depp's classic Fear and Loathing in Las Vegas quote, "We can't stop here. This is bat country." It is the most popular quote from the movie, and it is easily recognizable by even the most passive fan. The front of this T also features an orange, a red, and a brown bat to the left of the text. The design's offbeat images and unsteady font effectively invoke the wired and dissociative tone of the movie. 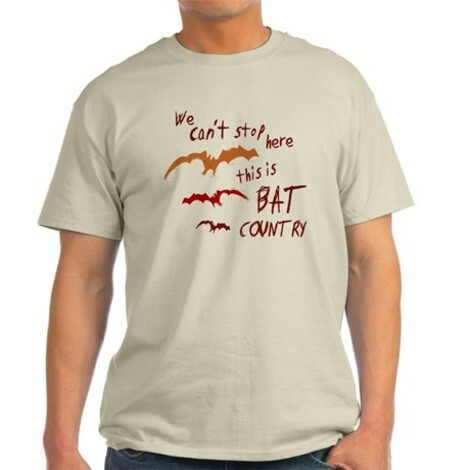 This Fear and Loathing Bat Country t-shirt is available in other colors, including an all white design on a black tee. In addition to the We Can't Stop Here, this is Bat Country tee above, browse the Fear and Loathing Clothing Gallery for more apparel like men's and women's clothes, kids shirts or hoodies.